A commitment to positive mental health benefits everyone in the workplace. It improves morale and results in lower absenteeism and greater productivity. It also indicates that an organization values and respects its workforce, honors the work its people do, and supports those who are dealing with occupational stress and trauma. 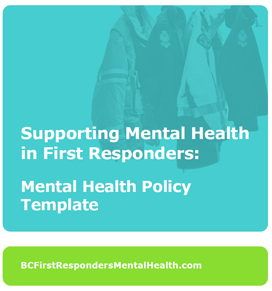 All employers in first responder organizations should implement a written mental health policy statement clearly supporting positive mental health.